Exploring Beaver County – New Brighton, Pa. I call myself a proud Beaver Countian. Other than my four years in college, and the following two when I lived up in Moon, I’ve lived here in the county pretty much my entire life (Brighton Twp., 21 years; Bridgewater, 8 years; Beaver, 6+ years). Lately, though, I’ve been wondering: How much do I really know about the communities that make up this special place in good ol’ Western PA? That’s why I’ve decided to start a new blog series called “Exploring Beaver County”. Every couple weeks I’ll be visiting, exploring, and then blogging about a different Beaver County community. Think of it as travel writing, just without all that pesky traveling. I agree wholeheartedly. That’s why I’ve decided to do my exploration via pedal power (or shoe-leather power) whenever possible. Coming into New Brighton from the south along Rt. 65, the first thing you encounter (besides the Y and the iconic Hank’s Frozen Custard) is what I’ve been told was once known as “Millionaires’ Row.” And it’s easy to see why. For nearly a mile on either side the street is lined with stunning old homes in an array of architectural styles. True, some are in desperate need of a little TLC, but there are many others that have been properly cared for or refurbished and are in beautiful condition. Riding past these historic homes on my bicycle, for the first time I could really appreciate their intricate details, something you just can’t do when you’re zooming past in your car. One of my favorite homes is at 1408 3rd Avenue—the recently repainted home of industrialist Edward Dempster Merrick (1832–1911), who founded the Merrick Art Gallery (1100 5th Ave.). As I mentioned before, New Brighton is chock full of history, as is evidenced by its dozens of historic homes and buildings still in existence today. From early industry, to the Underground Railroad, to its booming canal years, the town is a history buff’s dream. That said, I’d like to focus on modern New Brighton (I’ll leave the history to the experts). One of my favorite things about Beaver County is its many distinctive main streets, and New Brighton’s main street, 3rd Avenue, is one of the nicest ones around, thanks to a very well done streetscape renovation. Many of the street’s historic storefronts have also been well-maintained and renovated, such as Hallowed Grounds, Wagner’s Home Center, and Head to Toes Salon & Bodyshop, to name a few. That said, the downtown district also has several empty or dilapidated storefronts, as do many of our county’s downtowns that are still struggling to find their place among the modern malls and “big box” retailers. The good thing is New Brighton has seen a resurgence in recent years as more and more people are seeing the value in these quaint, old business districts. 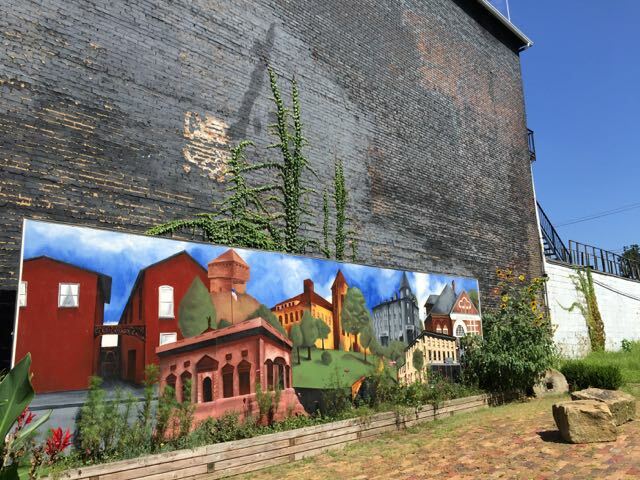 On one side of 3rd Avenue, Brighton UP, a grassroots volunteer initiative, transformed an old empty lot into a beautiful gathering space, complete with a stunning mural of some of the town’s many landmarks. What a great example of citizens taking the initiative to improve the quality of life in the town in which they live! Just off main street, down along the Beaver River, you’ll find a hidden treasure known as Big Rock Park. With lots of cozy seating, walking paths, and riverside overlooks, it’s the perfect place for a picnic or a quiet afternoon with a good book. If fishing’s your thing, the park is adjacent to the New Brighton dam—another scenic spot with plenty of angles for angling. I spent a few hours exploring New Brighton’s main drag as well as many of its residential back streets, and I had a great time getting a closer look at a town I’ve driven through a thousand times but never really taken the time to know. My final stop was at Sherwood House Antiques (1301 Third Avenue). Again, I’ve driven past this place a million times and always wanted to check it out. And I’m so glad I did. The store features two floors of antiques, mostly furniture. But the coolest part about it is it’s located inside an old carriage house. The store itself is an antique! If you’ve never been to New Brighton, or if, like me, you’ve driven through it but never taken the time to look around, it’s well worth a visit. I know I’ll be back soon! Brighton Hot Dog Shoppe – Legendary dogs and fries! Brighton Music Center – A musician’s dream. Main Street Market and Deli – Home-cooked goodness. Hallowed Grounds – Coffee. Nuf said. Merrick Art Gallery – Stunning art in a unique setting. Sherwood House Antiques – For your inner treasure hunter. New Brighton Public Library – Check out their new addition! Churches – Great for a do-it-yourself walking tour! Rosalind Candy Castle – Again, nuf said. 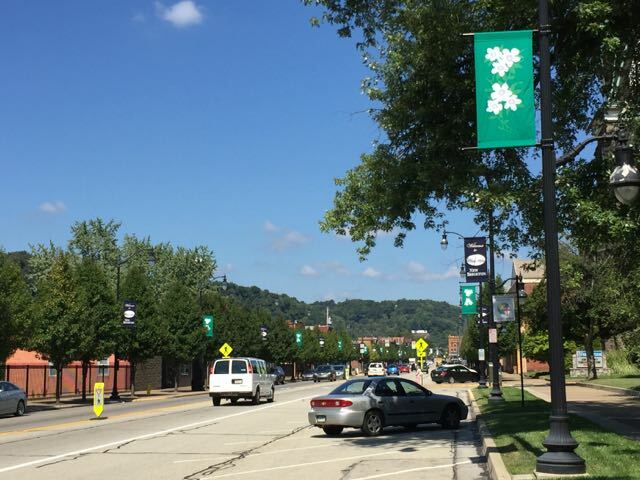 15 Responses to "Exploring Beaver County – New Brighton, Pa."
We’re situated on Millionaire’s Row, so obviously I love this post! (We’re struggling to get our Victorian mansion up to snuff on the outside. The inside’s in good shape.) I’m proud of New Brighton since its recent in-town upgrades. Within a half mile of our house, we have a coffee shop, a library, a small grocery store, banks, a chocolatier (how could you have forgotten Rosalind Candy Castle? ), and just about anything else you’d need in a small town. And even though we live on the “main drag” through town, we often have friendly visitors on our back porch and yard such as squirrels, bunnies, cardinals, nesting mourning doves (in our window sills), and an occasional possum, groundhog, or raccoon. Glad you chose us as your first stop! I grew up in New Brighton so it is definitely “home” to me although I no longer live there. Thank you for this journey thru my childhood home and the reminders of what’s still there!! Great article as always. Just wanted to mention The Sports Factory is located in New Brighton. They’ve been serving the Beaver County area 25 years strong. Don’t forget New Brighton has one of the best Halloween parades in the county. Great article!! I also love Beaver County and all the historical significance. Can’t wait for Beaver Falls and Koppel articles! Thanks for the great article. I grew up in New Brighton and still miss it to this day. I took your article and posted it on facebook group: “You’re probably from Beaver County, PA if….” Alot of people are reading it in the last couple of days. I grew up at 1403 3rd avenue, and what a charmed childhood we had. We walked and rode our bikes everywhere – Central school, the library, downtown, the old YMCA, etc…! Our friends and relatives from Florida and California loved to visit because their homes didn’t have basements, second floors or attics. They loved the grand staircases, the back steps, the high ceilings, beautiful woodwork, and camaraderie with all the neighbor kids. What a life! Thanks for sharing your perspective! Loved this post, Val! I grew up in NB and don’t get back as often any more, so it was great to hear this. By the way, my aunt and uncle, the Raders, lived next door to Edith Brkich in Bridgewater for years. I even remember her white dog Segun (sp?) And her chicken coop! Just bought an old 1858 home in new brighton on top of the hill on 6th street. We it a stunning yard and detailed home. With a long old stone wall around our home. Just love it!